What’s more convenient than a remote control? Captain’s Choice Boat Lift Remote Control lets you control your boat lift from up to 500 feet away, making your time on the water even more relaxing. Waves and wakes can damage your lift and dock while you’re away—but hopping out of the boat to raise your lift can be a hassle. 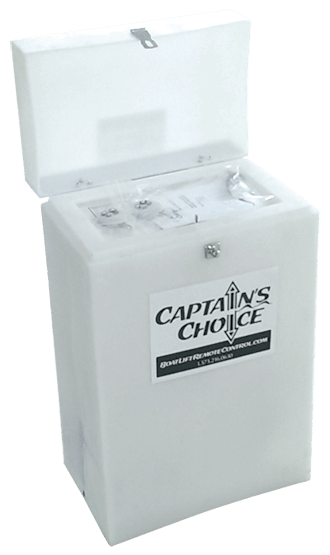 Captain’s Choice makes protecting your investments, while you’re out enjoying the water, as easy as pushing a button. Plus, we offer the fastest speed time (going up and down) of any remote on the market today. Captain’s Choice can be installed new, or retrofitted to suit your existing boat lift. At Captain’s Choice, we build our products to be reliable, easy-to-use and to bring you the highest level of performance out of your lift. Our service department carries inventory of all types of remote parts and can service any boat lift control. Customer service is our top priority, and we strive to treat all of our customers fairly and with respect. We do this with a quality product, fast service, fair prices and a true concern for what will best benefit our customers. Timed Raise Feature activates the raise function for a set time (:15, :30, :45 or 1:15). Use this button to raise your lift out of the water while boating. Note: the time is set at the factory and may be changed to suit your lift. We also service all makes and models of remote controls and manual controls. If you are on Lake of the Ozark, and have a boat lift, we can take care of your control unit needs. Call 573.216.0630 for an appointment. Keep your boat, dock and marine equipment clean and fight stains with Cove Supply powdered cleaners and specialty accessories. Designed with boaters in mind and tested on the most demanding applications, keep your boat looking its best with Cove Supply.